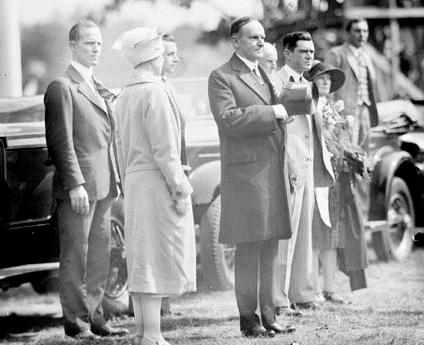 June 14, 1927 – Headed to the Black Hills of South Dakota, the presidential train of Calvin Coolidge stops in East Chicago at 3:00 p.m. The presidential party is driven a dozen miles to Wicker Park in Hammond as state and city police officers, along with national guardsman “present an unbroken guard for the presidential party.” [Chicago Daily Tribune, June 14, 1927] The Calumet region is represented by 150,000 people as the president dedicates the park, “an oak covered plot of ground bordering the wooded banks of Hart creek, a picturesque natural forest of much nobility in aspect, though limited in area.” It is a quick affair as the Coolidge’s party boards the west-bound train at 5:00 p.m. at the Hammond station. The above photo shows the President standing for the Pledge of Allegiance at the Wicker Park ceremony. June 14, 1992 – Despite Michael Jordan being held scoreless for the first 11 minutes of the game by a tenacious Portland Trailblazer defense, the Chicago Bulls win the game and earn their second NBA championship, defeating the Portland team in this sixth game of the playoff series, 97-94. Unfortunately, the city’s euphoria over the win quickly turns ugly, and by the time the sun comes up the next day Police Superintendent Matt Rodriguez says that the number of those arrested could exceed 1,000. Lawbreaking and violence are widespread, ranging from stores that are burned to the ground on the West Side to windows that are broken or shot out on North Michigan Avenue. Mayor Richard Daley says, “When people have an excuse to loot, they loot. When they have an excuse to shoot, they shoot. 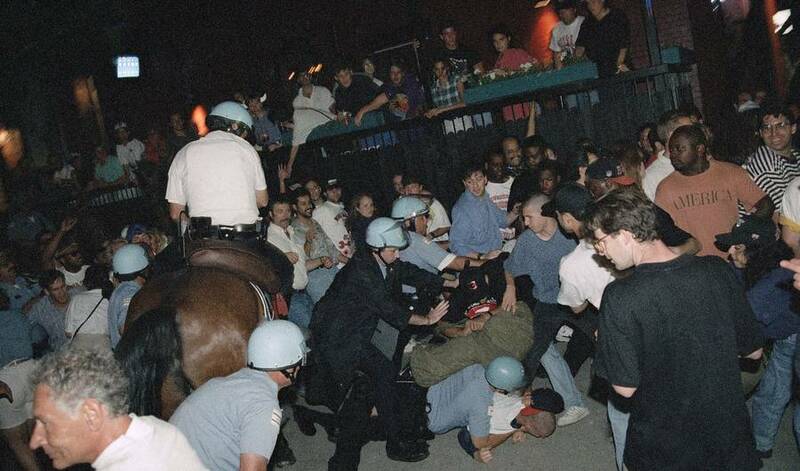 People just wanted an excuse.” [Chicago Tribune, June 15, 1992] At least 95 police officers are injured, two of those by gunfire. The Chicago Transit Authority reports damage to 52 buses and 68 elevated train cars, most of those marred with graffiti. June 14, 1969 – The Chicago Tribune gives a shout-out in an editorial “to the many open spaces which building owners and architects have provided to make downtown Chicago a more civilized place.” [Chicago Tribune, June 14, 1969] Today this editorial reminds us of something that we take for granted, something that was a rarity as the 1960’s began – open space in the heart of a city in which every square foot of property is a valuable commodity. It could have been a lot different. Think of it – within the space of nine short years the city received four great plazas in conspicuous places: the Civic Plaza in front of the 1965 Chicago Civic Center, now the Daley Center; the plaza, now filled with an Apple Store, in front of the 1965 Equitable building at 401 North Michigan Avenue; the First National Bank plaza with its Ferris Bueller fountain of 1969; and the great federal plaza north of the Kluczynski Federal building and its Alexander Calder stabile, "Flamingo," completed in 1974. We are today the recipients of the foresight of those planners of the 1960’s. 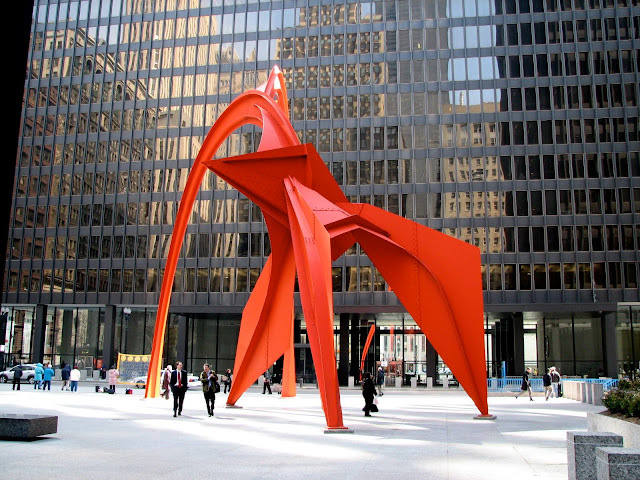 The Tribune was right on the money when it stated, “We commend the building owners for sharing some of their expensive land with the public.” The Exelon Plaza at Chase Bank, along with the Ferris Bueller fountain, is shown above.